Paving Doncaster, Natural stone paving slabs. Here is selection of our recent paving projects in Doncaster gardens. The image on the left shows Black limestone paving when dry, A range of paving sealants can be applied to enhance the look of this natural stone slabs. 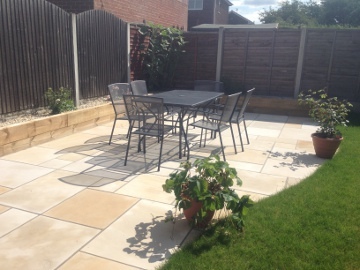 This patio was installed over the clients existing brickwork as requested. Black limestone Patio in IntakeAnother paving project completed in natural black limestone. This image shows a small paving circle recentley installed in Thorne just North of Doncaster. On this occasion we used man made paving whcih is available in a range of colours and is generally cheaper than natural paving equivalents. 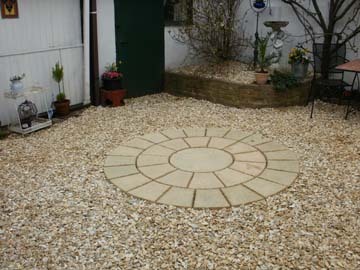 A small paved area such as the paving circle in the image to the left can add decorative touch to a relatively simple low maintenance garden. Natural paving slabs are slices of larger rocks which are then calibrated into similar thickness's. Often there is variation of up to 10 mm sometimes within one slab, for this reason more care has to be taken when laying natural paving. An individual bed of mortar has to be prepared for each slab and often adjusted to enable the lb to sit at the right height to the slabs around it. For this reason installation is a little slower and slightly more expensive. With most natural stone the surface texture from one slab to the next can also vary dramatically with natural faults such as lines of other rock running through them and an uneven surface. Natural paving is very popular for those who do not like a formal man mad look. Most paving slabs require sub base consisting of crushed limestone or similar aggregate compacted witha whacker plate. The thickness of the sub base required depends on the paving slabs used and how firm the ground is. 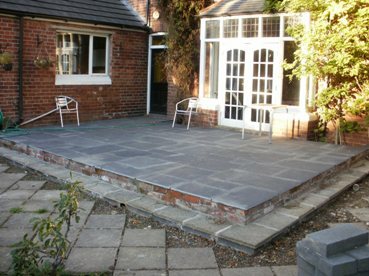 Some types of paving slabs can then be laid on compacted sand whilst we prefer to lay all our patios on a solid bed of mortar for a lasting surface that will not move. We do not use the dot and dab method, despite being the quickest and easisest this means that there are voids beneath the patio that can fill up with water before freezing and destroying your patio. Please use the online enquiry form to arrange a paving quotation or give us a ring via our contact page.